In this illuminating study Sykes explores the meaning of psychological health and well-being. She examines three historical illustrations of interdisciplinary dialogue between theologians and psychologists that took place in the United States from 1940 to 1960 and two contemporary theoretical voices—critical psychology and existential analysis—within the discipline of psychology. 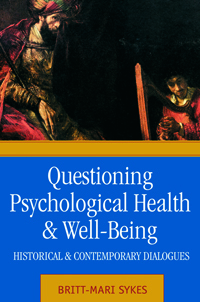 The book explores the questions and concerns raised by mid-twentieth-century psychologists and theologians about the expansion of psychological theory and the shifting definitions of what it is to be psychologically healthy and productive. The book suggests that these questions continue to resonate within contemporary debate about care—both of ourselves and others—about psychological health and fulfillment, and about the well-being of society generally. Analyzing the dialogue that emerged within the New York Psychology Group (1941–1945), Sykes discusses a series of lectures given by existential psychoanalyst Viktor Frankl at Harvard Divinity School in 1957, and examines the Harvard Project on Religion and Mental Health directed by Hans Hofmann from 1957 to 1961. In all three cases, the rapid rise and influence of the social sciences and psychological scientism caused concern. Psychology’s view of human existence was too narrow, these thinkers argued; psychology needed to embrace the relational, social, and ethical reality of being human. Such an enlarged paradigm would situate individual health within familial, cultural, economic, political, and religious contexts. As such, the quest for understanding wholeness and well-being was underway.